Here at Interior Decorating by E & J, you can choose every aspect of your custom furniture design. These pieces will be unique custom made upholstered furniture built to your specifications. We welcome your designs, drawings and ideas. Just tell us about the piece that you desire and we will create a one of a kind masterpiece that you can enjoy and call your own. Choose from a wide array of frames from dining chairs to sofas. These are quality bare-bones frames. We will assemble and prep the frames with webbing, springs and any underlayment required for the piece. Then choose all of the finishing touche for your furniture. You can choose style, height, size, finish and ultra soft cushions or extra firm. You can choose each step of your custom furniture design. All of this means that you will have a unique piece of furniture, tailored to your style, taste and fits in with your decor and space. E & J also has its own chair Designs. 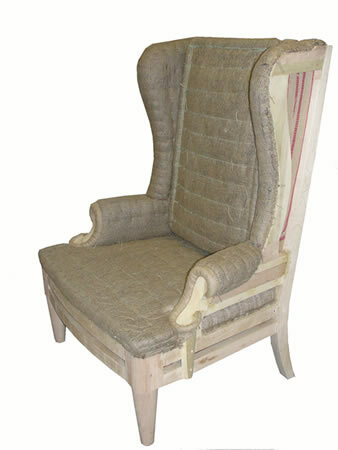 Our well-carved chairs are in muslin and can be finished in any color. Most of our chairs are in stock and can be ready in 2 weeks for shipping. We offer 10% discount if we upholstered the chair. Call 718 -786.6336 or e-mail us.